Times of emergency call for quick action to get victims into safe shelters. Plenty of easily-assembled emergency structures have been designed over the years, but Australian architecture firm BVN Donovan Hill has presented an interesting take on the topic. 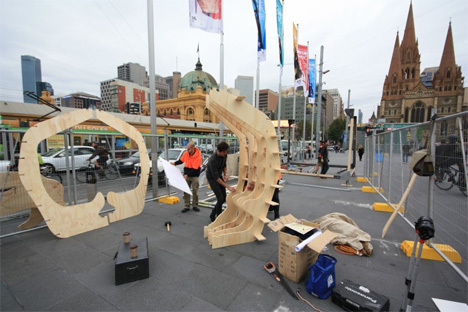 Their idea goes together like a 3D puzzle, each piece of plywood slotting together as easily as a flat-pack furniture kit. 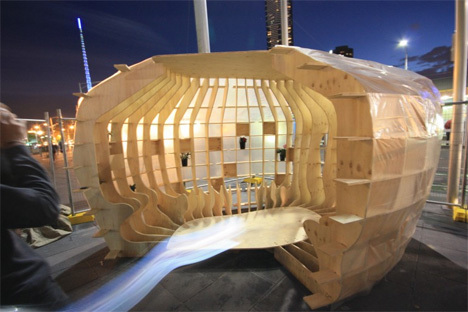 The shelter consists of pre-cut plywood boards that would be delivered to a disaster site flat-packed. 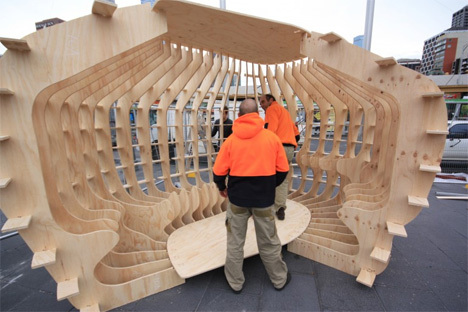 Each piece has notches that fit into the next piece; assembling one of the shelters requires no tools other than the hands of one or two people. 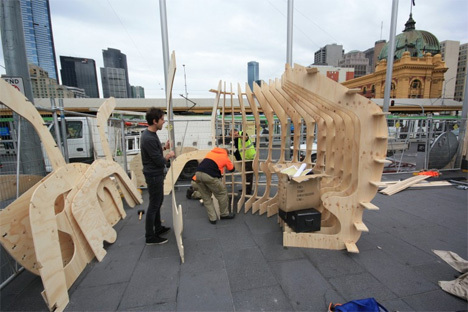 Once the wooden skeleton has been assembled, a waterproof skin is put on the outside to keep out the elements. The goal is for the structure to be able to be assembled in just one day. 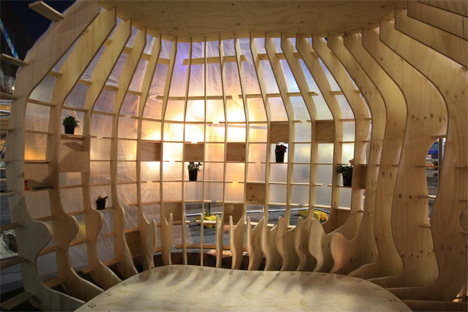 The inside of the structure features contours that jut out to create shapes that could be used for sitting or sleeping. That’s according to the designers – to us, the thin plywood shapes don’t look comfortable enough to support a person without an extreme amount of padding between them and the human body. According to the designers, one of their main goals in this design was to create a space that is not simply utilitarian, but one that creates happiness in times of tragedy. The shelters are small – around 100 square feet – but very heavy at about half a ton each. This makes each one quite substantial and perhaps usable for long periods if necessary. The structures can be grouped together to create a temporary community, with some buildings serving as meeting places instead of grouping all of the victims together in one very large space. The concept will require a significant amount of fleshing out before it becomes a viable option for disaster relief, but the idea of an easily (and quickly) assembled, private temporary home is one that will appeal to just about anyone who has ever been displaced by a natural disaster.